Quizlet: "The best way to study languages, vocabulary, or almost anything"
Quizlet is an online flashcard tool that I have used extensively in all of my classes. 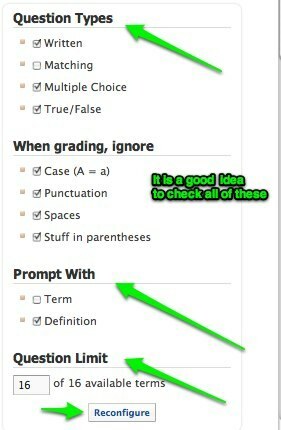 The reason that I like it so much is that you can create groups for your classes and they can share sets of flashcards. This cuts down on the time spent creating flashcards and maximizes the time spent learning the information. 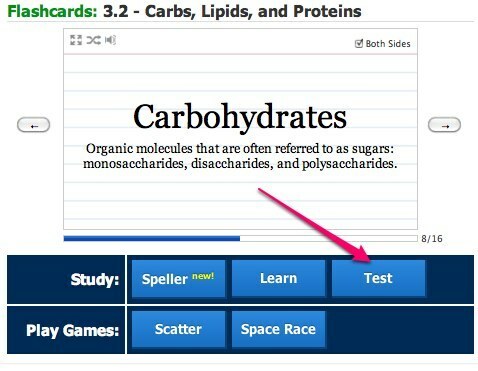 If you don’t want to use it for this purpose, students can also search for sets on any topic, including things like SAT vocabulary, without being part of a group. One great thing about Quizlet is that it not only has basic flashcard review functions, it will also automatically transform the flashcards into test questions or memory games. After making their selections, they just click reconfigure and they can take the test and receive immediate feedback on their answers. The games feature on Quizlet is what makes this a big hit with my students as they can compete with each other in a group for high scores on the different games. Space Race is my favorite as it is similar to Space Invaders, an Atari classic that I played when I was younger. The students have so much fun trying to get the high score that they don’t realize that they are learning! You can create sets for the group if you want, but I have had no problems having students take responsibility for this. In IB Biology, my students contribute to collaborative learning docs for each unit, and one student has to sign up on the doc to do Quizlet sets for the unit. My only piece of advice is to take the time to teach students how to make flashcards first, and make sure that they make everyone an editor so that you can go in and clean them up if necessary. We don’t want kids learning the wrong information! To get started, create your free account at Quizlet.com.